Excellent article Gregor. You really got Hall to talk about his game and what he wants to improve on. I love how focused he sounds on being smarter entering battles and how he wants to score more on his chances. He is one of the few players who we know gives a solid effort every night. Thanks for kind words. Glad you enjoyed it. Hall spoke like a player determined to improve his game. That is a good sign for the Oilers, and if his teammates are paying attention they will follow him. All that’s left to complete the circle is a picture of him in a towel with a beer in his hand next to Gary Coleman! Hall IS the Oilers, love this kid. I knew he was fast, but when he smoked Cogs in that drag race last year I still could barely believe what I was watching. I don’t think Ference is keeping the C away from Hall. I think Ference is holding it in trust. Ference is also showing these young guys that good media relations, good community involvement are all part of the job as well. They’re learning that from him and will be ready to wear the letters on the chest in the future. If it’s Hall, putting on the C, I’m excited to see it. The guy already puts a ton of pressure on himself, he doesn’t need to wear the C to take the rest of the media and community pressure. As the franchise player, he’s going to take that pressure anyway, but Ference can share that load. I wouldn’t be surprised to see Ference step back to an A next summer. Being a home town boy, Ference really gets into community efforts and events. I remember Horcoff kind of being invisible in the community, not Ference. Now obviously an active community leader does not a good Captain make. But Ference has the maturity I think to lead the team. I love Hall’s drive and ethic, and I firmly believe he will be Captain one day, but I think Ference is doing a great job currently. Vocal leader (doesn’t have to be the loudest guy in the room, but can’t be a shrinking violet either). Not a replacement level player. Ference’s only weak point is that he may be approaching replacement level. He needs to continue to show that he’s at least one of the best 5 defensemen on this team. Well said. Let Hall develop his game more this year before passing the torch of leadership. I might even give him a couple of years to really solidify his game before distracting him the the official ‘C’. My thoughts exactly. As much as I complain that you don’t build from the wings in, looking back there’s no way I take Seguin over Hall. Apparently Seguin has matured by leaps and bounds the past two seasons. The head to head games of this – arguably the biggest player rivalry of this era – should be fascinating to watch. You know…there’s a big difference between membership and ownership. That’s ownership. Give him the C.
Forgot the guys name who beat him for rookie of the year. With a better supporting cast Hall should feel more comfortable passing off rather than trying to force a play and turn the puck over. Not only will this reduce his giveaways, it should also allow him to slip into dangerous areas to recieve passes and improve his shooting percentage. The kid knows what he needs to do to improve and I totally agree with him. I really think Andrew Ference should do the honorable thing and pass his Captaincy onto Hall. Not to take anything away from Ference’s leadership but rather acknowledge the true head of the snake. The engine that propels Oilers. Ive felt this for sometime but after reading this article its Crystal clear who the leader of Oilers should be. Even the most determined anti-Oil persons whom frequent this site, must see that Hall is the cornerstone of this team for years to follow. He is deserving of this status, in my opinion. Each year he keeps improving, maturing and is becoming, if not already, the face of the Oil. He is growing into the leader that this team needs. Thus far, he has carried himself well both on and off the ice. How can any hockey fan of the game itself not see that Hall is as stated by another poster, a STUD! From the tone of his comments it is apparent that Hall, at 22, has taken a major step toward maturity. He has a magnificant tool kit and, with this new and mature mindset, he looks to be ready to take his game up a further notch. This bodes well for the Oilers. 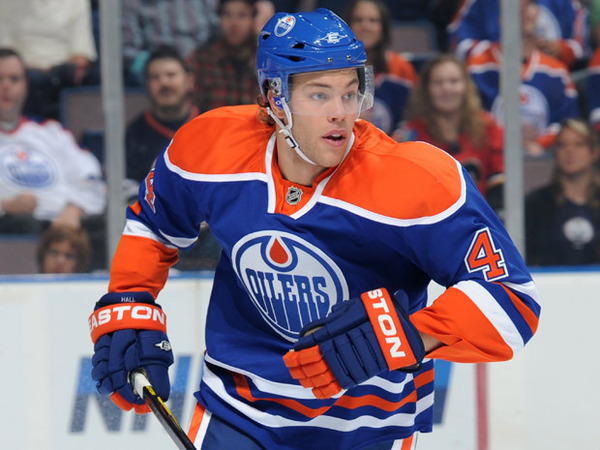 If he is able to make these subtle changes to his game and influence the other young players on the roster to make similar improvements, he will have made a huge statement regarding who the next Captain of the Oilers should be. I look forward to watching him play this year. If RNH and Eberle can further develop as well, the Oilers will have a bonafide first line that can contend on a nightly basis. Furthermore, our patience will have been rewarded. Hall is an absolute beauty. I’m glad we get to see him grow, and mature into one of the leagues premier players. I only hope the rest of the wunderkids also take the initiative, and follow Hall’s example. oh boy oh boy oh boy! golly gees, this guy is gonna be an absoulte beast! The attitude is absolutely what i think we all wanted and NEEDED to hear. I just hope the rest of the squad sees and hears what our “captain” is doind on and off the ice and follows his lead. BEAUTY! To me i don’t really care if Hall wears the C or not in the next couple years. Let him dominate on the ice, based on what we’ve seen he’s obviously vocal in the locker room. Obvuously the C is an honor but i hope no one is suggesting that the C is going to improve his game. Not only that, as Oiler fans we’re all hoping the wing and D offseason improvements will be enough for this team to gel and finally be competitive… But years of experience and no NHL C depth has us all knowing in the back of our heads that this season could fall apart in a few short weeks with some key injuries. May’s well give it another year and wait until we know for certain the team is competitive; giving Hall the C and having him captain a 27th place team won’t accomplish anything of value. With a little freaking luck … we are playoff bound!!!! What you do and how you behave off the ice is just as important as on the ice when representing the team as captain. Still a little maturation required in that area for Hall. I am guessing next year will be when he receives the C.
I seriously hope that Hall’s counterparts take the same message. There are many other players on this team that need a similar dose of ambition. Gregor, your interviews are the best. Great job. Reading Hall’s words, it is more clear than ever to me he should be the team captain. He just gets it.